We’ve had two papers accepted into CHI 2018 based on the Ardler Inventors project, the first of which is based on fieldwork at six hackathons. I’ll write about this one first because chronologically it was the first piece of work done on the project, which informed the design of our Inventor Days at later stages. Hackathons have been around for a while, but they’ve become increasingly popular in recent years. They’ve transcended the software communities that originated them and entered the mainstream, being taken up by a wide range of organisations, including charities and museums. Many of these share similar goals with other hackathons—that is, to bring developers together to rapidly develop new applications and prototypes. But another breed of hackathons has emerged that takes key properties of the format, particularly their intensive, co-located nature, and uses them to engage with very different audiences. Although they are still often focused on the design of future technologies, they de-emphasise the actual act of creating software, to the extent that some have been described as “hackathons with no hacking”. Something about the format has captured people’s imaginations in a way that other types of participatory design activities seem not to, inspiring time-starved people to give up entire weekends to imagine future technologies. Our view was that HCI researchers could learn a lot from these “mainstreamed” hackathons, either in further re-positioning them towards research or in designing other participatory activities. With this in mind, we attended and participated six hackathons, to understand how they worked, how they meaningfully engage non-technical participants, and what we can learn from them for the design of our own events. Photo © Zoe Prosser for Snook. Hackathons as public engagement. For most of the organisations and the participants, the actual creation of prototypes and ideas was not the primary purpose of the events. Instead they served as an exciting and creative way to engage with a new topic or issue, and with new communities. For many of the organisations, they served almost as a form of consultation exercise: attendees brought new perspectives and ideas to issues that the organisers had been working with for some time. The hackathon environment helped them to reach people in a more creative way that wasn’t possible with other types of workshop. Participating without coding. Given the lack of focus on the prototypes themselves, it wasn’t difficult for the events to engage with a wider audience beyond technologists. Much of the “hacking” involved production of content, such as video, cardboard mock-ups, or even just discussions of concepts. Where teams did produce code, members from non-technical background often served roles including researching, creating content, or providing inspiration and insights into the specific topic that coders lacked. Tensions in the format. Despite the enthusiasm with which they’ve been taken up, the hackathon format didn’t always sit comfortably with the new audiences it had been targeted at. From simple issues with communicating what its purpose was, to more fundamental challenges around inclusion, organisers had to put significant effort into creating an environment that was welcoming. Our own subsequent work in this area took a lot of this on board, thinking about how we could address some of these issues without losing the core of what made hackathons attractive. 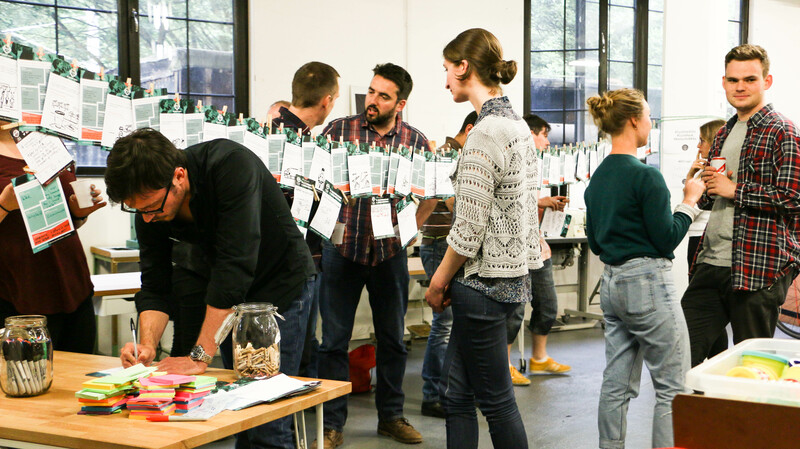 Hackathons as participatory spaces. 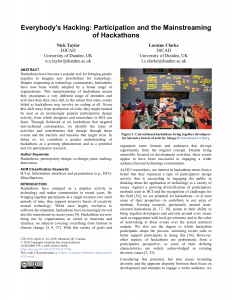 Above all, we came away from this research with the sense that the attraction of hackathons was in the creation of participatory spaces, where the right mix of people and skills could come together to engage with the subject on their own terms. Moreover, this was not just a means to an end, but an enjoyable activity in itself. We were particularly reminded of Vines et al’s call for participants to be able to take a more active role in configuring participatory activities—something that was certainly happening at the events we attended. This entry was posted in Ardler Inventors, Publications and tagged chi2018, hackathons by Nick Taylor. Bookmark the permalink.